I had defrosted one of my ham steaks for a meal that ended up not happening this Sunday. I do not want to re-freeze it, so I must think of a dish to make with it. Jan, who is just coming off a soft food diet, suggested ham and beans. Real food, but soft enough not to disturb her healing oral surgery. I really like ham and beans, but it never seems like quite a full three course meal. It has the meat and starch, but it always seems a bit short on the green vegetables. It usually has some white vegetable matter (onions); some yellow vegetable (carrot); but the green celery is more of a flavoring than a vitamin packed side dish. Some pictures were too “bean-y.” Others were beans in broth. They might be fine dishes, but they were not the bean dishes I was looking for. Finally, I saw a few pictures with bits of green floating amongst the beans. A closer look at the recipes and I found that they had added spinach. And that was just right! With that decision made, I turned to my beans. I have a lot of small packets of different beans. Those left over from different dishes. I finally chose pinto and small red beans. My idea was that the small beans would over-cook and break down to thicken the stew. While the larger pinto would be just done, firm and tender. I have only three people eating this stew, so I do not want a massive pot of beans. While leftovers are good, there is such a thing as too much. I will use a cup and a half of beans, rather than my usual two and a half cups. Normally, when I make a pot of beans I have a meaty ham bone to make my ham stock. This time I am using a ham steak and I do not want to overcook it to make a cooking broth. I will use water and beer for my cooking liquid. 1. Sort and rinse the beans. Put them in a pot, with one half teaspoon of salt and four cups of water. 2. Bring the pot to a boil and then remove it from the heat. 3. Cover the pot and let it rest for at least one hour. Tip: This is the quick soak method. I have experimented with many ways of cooking beans and this is my preferred method. First, you do not have to think the day ahead for an overnight soak. And, second, the vegetable do not get cooked to death from the long slow cook you have to do when you start with un-soaked dry beans. 4. Add the bacon fat to a large Dutch oven and sauté the onions with the remaining salt, until starting to pick up some color. 5. Add the celery and carrots and cook until limp, about 4 more minutes. 6. Pull the vegetables to the sides of the pot and add the garlic and sugar to the hole in the center. Sauté the garlic for one or two minutes and mix them into the rest of the vegetables. 7. Add the cayenne and pepper to the pot. 8. Drain the beans and add them to the pot. Reserve the soaking liquid. Tip: Many bean recipes have you soak the beans overnight in heavily salted water. The sodium in the salt replaces some of the calcium in the bean hull to give you a more tender bean (at least that is the theory). However, when you discard the salty soak water, you are also washing away much of the beans color and perhaps their nutrients. This seems to me to be throwing the baby out with the bath water. When I soak my beans, I only use as much salt as I am planning to use in the pot and then I save the soaking liquid for the final cooking. 9. Measure the remaining soak liquid and add enough water to make two cups of liquid. Add it to the Dutch oven. 10. Add the beer to the pot and bring it to a boil. 11. Bring the Dutch oven just to a boil, put the lid on and place it in the oven at 325° F.
Tip: I always prefer to cook things like beans in the oven rather than on the stove top. The bottom up heat of the stove has the constant risk of scorching the beans at the bottom of the pot over the long cooking time. The all around heat of the oven removes this risk and cooks the beans more evenly. 12. Stir the beans about every 20 minutes and bake until beans are almost tender about 1½ hours. 13. Chop the ham steak into large dice and add it and the frozen spinach to the pot. Adjust seasoning, if necessary, and continue baking for 10-20 minutes more. Tip: Check the thickness of the stew at this point. 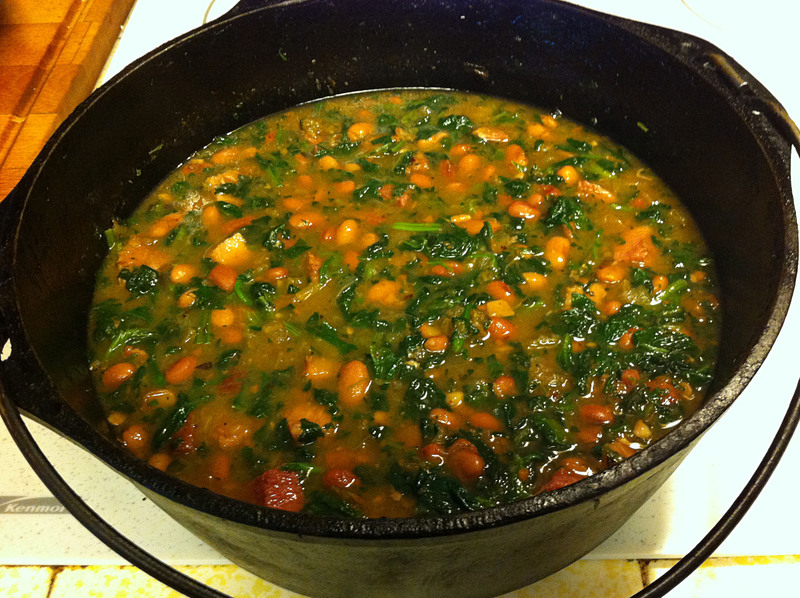 If it seems too thin, mash some of the beans against the sides of the pot and stir them in. If it seems too thick add some more water or beer. 14. Remove the pot from the oven and let it cool for 10 minutes before serving.